Next weekend I’ll be running my sixth half marathon and my first one since hitting 40 years old. As I get older the miles feel harder and harder, but I continue to push on. I push on, because I know that if I stop and become sedentary, then it’ll be harder to gain back my form and stamina. I’ve been running semi-competitively for over 12 years now and have learned a lot through running. Primarily, I’ve learned that there are a lot of similarities between running and personal finances. As I train I’ve seen that training is like the pre-retirement time-frame of your life. With the race period being retirement. As I trudge through my working career I feel like I’m nearing (or am close to) the peak of my training. In terms of earning potential, I’m probably close to my midway point, and will soon (5-10 years) be approaching that part of the course where my passive income streams exceed my earned income. It is a good feeling to see how much my hard work has netted my family and I over 18 years. In a way, I’d suppose it is how a farmer feels in the fall. He is seeing his crop get to the point of being ready to be harvested. 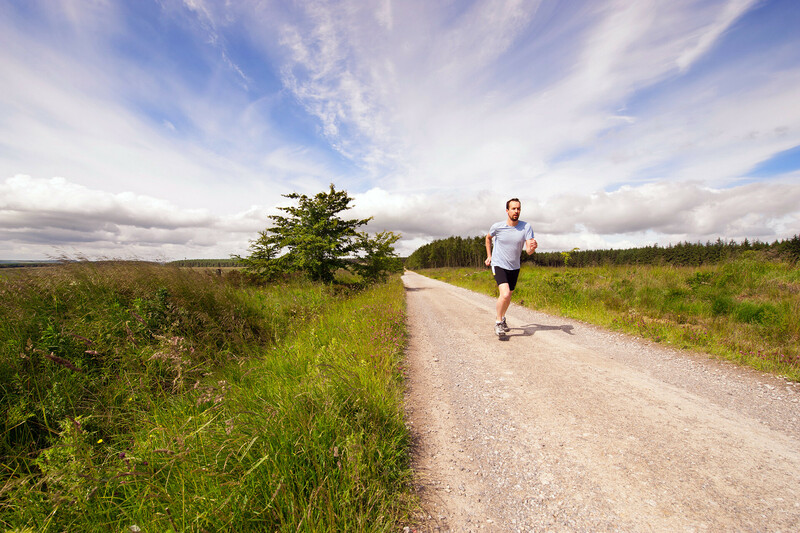 Often times, when people run a marathon their posture normally begins to degrade as the body becomes weaker and tired. This results in decreased lung capacity, and inability to exhale all of your carbon dioxide. The build up of this will result in lactic acid in your blood stream making your legs and muscles feel weighty. In the same regards, if your debt to income ratio is high, then it will be harder and harder to get to financial independence. It might come as commonsense to a lot of people, but debt is a serious issue. Too many people walk into debt way too easily. Summary – keep a proper posture throughout your career and keep your debt to income ratio low! My big philosophy for the race is getting my weight down as much as possible. Fact is that you’ll have to carry your body weight (whether your heavy or not) over the entire course of the race. Just this morning I lifted my wife’s eight pound weight and thought about what it’d be like to carry this over the course of 13.1 miles next week. The coincidence here is that is how much I’ve lost in the last five weeks. So if I’d started the race five weeks ago, then it’d surely feel tougher to run with that extra eight pounds hanging around my waste. Your fixed expenses are just like that extra eight pounds hanging around your mid-section. Think about it for a second. Grab your waste (I’m doing it as I type this), and grab those love handles. It doesn’t need to be there, but it is. Fixed expense equally don’t need to be there. Does your DirecTV bill need to be high? Do you really need the unlimited data cell phone plan? Have you considered refinancing from a 30 to 15 year mortgage? Summary – reducing your fixed expenses will help decrease your financial weight and ability to get to the retirement finish line sooner. Nutrition and weight go hand in hand. During the non-race seasons I often let my nutrition lax a little. I still eat every three hours, but I don’t take out my 8 pm snack, which is usually three hours before bed. During my training I’ll also focus on cutting carbohydrates, and increasing the amount of protein and fat that I take in (makes me feel fuller). Your savings rate is a reflection of your debt, fixed expenses, variable expenses, and your overall lifestyle. If you have good nutrition (low debt and expenses), then you’ll have a good (above 15-25%) or excellent (25-50%) savings rate. For a lot of people these savings rates are “unbelievable”, which is similar to peoples’ perception of having proper nutrition (equally hard to believe). Summary – the point here is to start small and measurable. Start with even a 1% increase in your savings contributions. Don’t delay your financial health! It is too important! Overall, I like to take my half and full marathon training seriously. I know I’ll never be a Olympic marathon qualifier or be able to make a serious living from it. It is the goal of completing it, and putting it out ahead of me that motivates me. What is it with your retirement motivation? What is your motivation to get out of debt? I’d be interested to hear your thoughts. Leave a comment below! Picky – I couldn’t agree with you more! Buying back my time is what motivates me too! I would love the choice of not going to work.